Blue Bayou is offering a Valentine's Special - Romantic getaway for 2 includes: one full case of sparkling wine (award winning Segura Viudas Brut Reserva), a romantic picnic lunch for 2 on a secluded beach and a spa massage for two. $8,900 all inclusive. 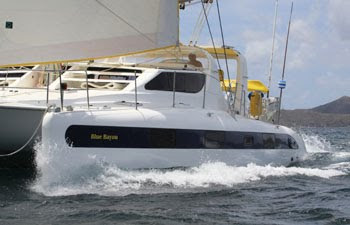 $8,500 half-board (includes all breakfasts, snacks, ship's bar, 3 dinners and 4 lunches aboard). 44' Luxury Catamaran Blue Bayou has three guest cabins, each with a queen size berth with memory foam, an en suite bathroom with electric head, separate stall shower, sink, reading lights, fan, air conditioning, opening ports for natural ventilation, and a non-opening window for light. We also have a double air mattress if you would like to sleep on deck under the stars! The yacht's interior is finished in warm and rich American walnut joinery with teak and holly soles. The salon has a dining table with leather settee, and the double sliding doors open to a large cockpit with seating for ten, and dining al fresco for six around a teak table under a bimini. There are sunscreens around the cockpit for shading the late afternoon sun. The combination of space not only affords privacy, but also offers many shared areas for dining, having a drink, sunning, or just hanging out together!